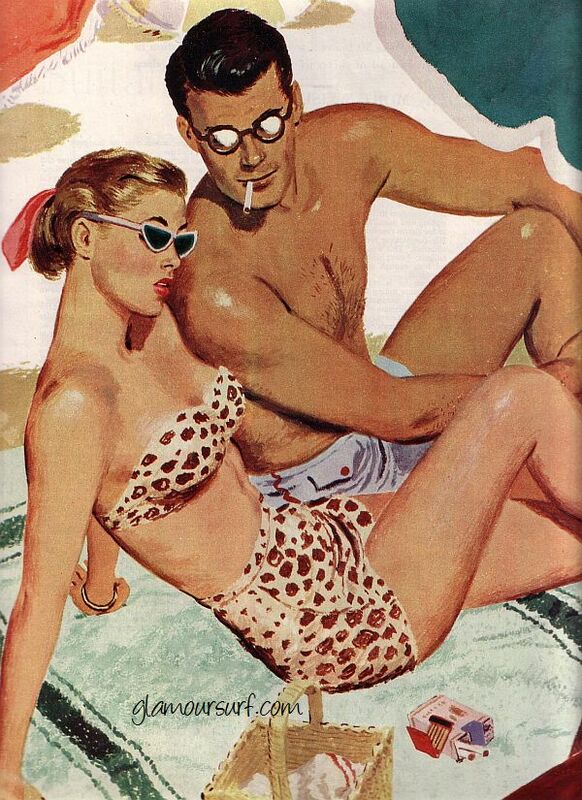 This is such a fun illustration by Robert Patterson from Colliers magazine, 1950. The title of the fiction story is "Bleached Blond." He couldn't really see her without his glasses, but he got the distinct impression that his girl was a honey. The tag on the image itself reads" She sat down glumly and poked a pretty toe in the sand. "It just happened last week, so I'm not used to the idea yet." I'll be reading this today when I take a break from the computer. It's just too campy not to ignore. After studying art at the Chicago Art Institute and in Paris, Robert Patterson began his career as a cartoonist for Judge and Life , and on the staff of French Vogue . He has done illustrations for dozens of magazines, for advertising and other media and for numerous books, and is a portrait painter as well. There's just something about summer that screams PIN-UP!! !